Circling to land at the airport, photographer Andy Jones nudged me to look out the window, “look there’s Teide”. “Where?” I had to ask him, all I could see were clouds. He pointed out that I was looking too low down, looking higher I spotted the cone of the volcano rising up above the cloud line. My first impression – that is a very long way up. Sir Bradley Wiggins first visited Tenerife in January 2011 but he was far from the first pro cyclist to use the Parador Hotel at the summit of Mount Teide. He was however unusual in choosing to publicly share his training time there. Lots of teams and pros – including Team Sky and Chris Froome – have stayed there in the past, but the fact that Lance Armstrong and a number of dopers have used Tenerife for training, and the seclusion afforded by the high-altitude hotel, has given the cynics plenty of fuel to conclude that riders using the hotel have motives beyond finding the perfect training conditions. 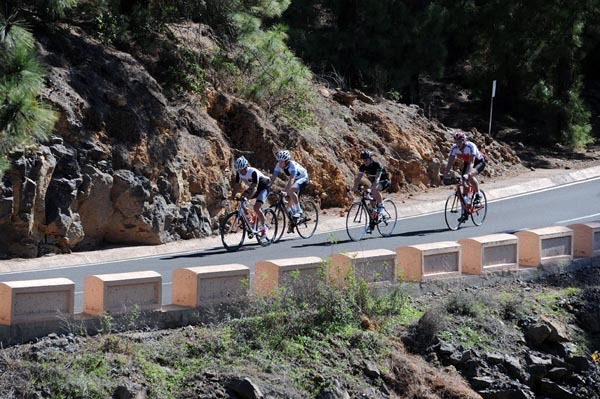 We are going to put that aside and look purely at the benefits Tenerife can offer, for any cyclist. 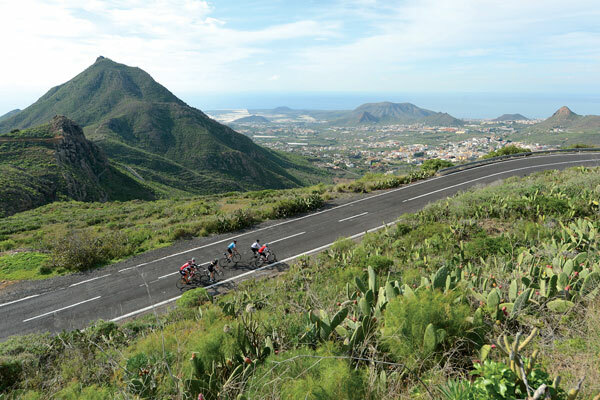 Why make Tenerife your next cycling destination? Tenerife is the largest of the Canary Islands, 200 miles off the west coast of Africa. It is a four-hour flight from the UK but conveniently within the same time zone. Triangular in shape, it is dominated by the volcano positioned right in the middle of it. The very top of Mount Teide is 3,718m, making it the highest mountain in a Spanish territory but the road, the part we were interested in, only goes to a little over 2,300m. The climate in Tenerife makes it the perfect winter training camp destination. The south side is in the rain shadow of Mount Teide and is dry and barren, but the north is more lush and green. This makes for varied riding even on a relatively small island. The road circumference of Tenerife is just 223 miles. Unlike the Balearics, another popular winter cycling destination, the weather is much more stable and predictable. Even in December when we visited temperatures can reach as high as 26°C in the day and they remain a comfortable 10-15°C at night. Having had snow in Mallorca in February and March, I’d much prefer to go to Tenerife to get a cyclist’s tan. Beyond the pleasant climate, the relatively cheap flights and a wealth of accommodation, there is one very significant reason why Tenerife is a great winter cycling destination: Mount Teide itself. Although not the highest road in Europe, it is the longest continuous ascent as you have the opportunity to start the climb from sea level. In just 35km you can ride from zero to 2,100m and it really is continuous, not a flat section or banked hairpin alleviates the strain on your legs. For the dedicated pro rider looking to accumulate as much climbing as possible it is perfect. You can cover as much as 4,000m a day in a relatively short distance. The other benefit is the location of the Hotel Parador on the plateau at the top of Mount Teide; this means that Tenerife meets the ‘sleep high, train low’ criteria. Altitude training as a way of increasing your red blood cell count and improving your capacity to process oxygen is well documented. Cyclists and other endurance athletes have been going to altitude for performance benefits since the early 1990s. Some riders struggle to make high-intensity efforts at altitude, an obvious problem if you are riding the cols of Europe in events such as the Etape, the Marmotte or indeed the Tour de France, so a period of altitude training will help them to acclimatise as well as offering training benefits. With nearly all roads leading to the top of Teide it is easy to do your training rides on either the lower slopes or the upper slopes. At the lower altitudes you are able to train more intensely because of the oxygen available, with the added benefit that you are doing your body less damage so will be able to recover more quickly. Even without going over 1,500m you could still easily accumulate 2,000-3,000m simply by ascending repeatedly to the mid-point of the climb. Tenerife is a fantastic winter destination. The weather is warm and stable and the roads away from the coast are quiet and well made. However, the climbing could be a problem for some. Before training on Tenerife you need to have developed a reasonable level of base fitness to get the most benefit from the long climbs and riding at altitude. If you hate climbing and have a low level of fitness you may find the day after day relentless climbing too much for your body or your psyche. However, the gradients are easier than many mainland European climbs and certainly less steep than a lot of UK hills, so while the climbing is more continuous it is a question of endurance as much, if not more so, than strength. To get a true feel for how tough Teide really is we planned a continuous ascent from sea level to the summit at 2,100m and then on to the plateau for a coffee at The Parador. Our guides for the day, Jen and Stu Caldicott from Polka Dot Cycling Holidays, were there to give us the pro treatment with support vehicle and navigational assistance – not that you need much, the only way is up. Starting on the coast at El Medano we rode as a group out of town with Jen calling directions from the rear and Cycling Weekly’s Symon Lewis setting a slightly too hot pace on the front as the road immediately began climbing upwards. Heading toward San Isidro we faced the first major challenge of the day, the bridge over the motorway. There was an audible groan from everyone as we fumbled for top sprockets and got out of the saddle, it struck me as rather worrying that I was already on the limit of both my heart rate and gears less than 5km from the start with at least another 30km of climbing still to go. By the time we had exited the town of San Isidro the group had split, I was perfectly content to chat with our guide and host about the riding on Tenerife, while the rest of the group seemed more intent on pushing the pace. With only three turns to navigate, a support vehicle, and an obvious regrouping point at the summit, it made sense to split up. The only way to tackle a long climb is at your own pace. The climb of Teide from the south side can be split into two distinct parts; the lower part up to Vilaflor and the more barren section leading to the top. Vilaflor is the highest village on Tenerife at 1,500m and can be reached by three different roads. For riders wanting to accumulate lots of climbing without the strain of going to altitude this is an obvious destination and conveniently there is a coffee shop and garage here for mid-ride refuelling. The road to Vilaflor winds gradually upwards and offers plenty of visual interest and relatively gentle gradients with only the occasional kick up to eight or nine per cent. At the time we were there it was surprisingly lush and green from recent rainfall but generally it’s dry and arid. Prickly pears and cacti line the roadside and much of the surrounding land is terraced with vines. Tenerife has several vineyards but while the wine is popular with the locals, barely any gets exported so try it while you are there. We stopped just past the petrol station in Vilaflor to refill bottles and regroup. While there we saw the Neon-Velo training camp pulling into the cafe with riders from Rapha, Wheelbase and Raleigh. Luckily for us they were using the roads up to Vilaflor but not beyond so we wouldn’t have to suffer the ignominy of seeing them zoom past us. After Vilaflor the character of the climb starts to change. There is less evidence of farming and the cacti give way to pine forests. The smell of pine trees and the orangey hues of the rocks makes this section reminiscent of Mediterranean climbs. While the road still twists and turns the gradient becomes a bit stiffer in places and by the time you reach the edge of the tree line and are into the rockier, more barren section you are pretty much resigned to using just the top sprocket of your cassette. The final 5km has some of the steepest sections of the climb and you certainly become aware of the 30km already in your legs. Unlike many of the cols in the Alps and Pyrenees, there are no cambered hairpin bends to alleviate the strain on your legs, if only momentarily, and there is certainly no flat section. It’s a perfect climb for making you maintain a consistent workload and focus you on your pedalling technique, as you cannot lift off the gas for a moment if you mean to continue forwards and upwards. By the time I reached the summit everyone else had already crashed out on the picnic blanket thoughtfully provided by Stu and Jen. The view from the top is quite spectacular – on a clear day you can see deep into the valley below but often you are presented with a view of the cloud that seems to hover between 1,200m and 1,500m a lot of the time. Watching the sun go down on this cloud inversion provided one of the most memorable and stunning moments of the trip. Between the summit of the climb and the Parador there is a 4km descent and then a long plateau before climbing slightly back up. This section is where Teide gets its description as being a ‘moonscape’ from. Barely any vegetation covers the loose surface and you can clearly see the lava flow and misshapen lumps of molten rock from volcanic eruptions. Unlike most climbs Teide can be warmer at the top than on the lower slopes where often the cloud can hang around even in the middle of the day. Certainly the day we rode it we noticed a significant temperature change when we reached the plateau. It is worth carrying several layers with you, as you can never be entirely sure what you will encounter. Having taken the best part of three hours to reach the summit I was looking forward to the descent, however first we had to climb the 4km back up from the plateau. While the coffee is really good at the Parador I wouldn’t recommend stopping for too long and if you are feeling a bit tired turn around at the summit rather than dropping down the other side as that extra 4km felt a struggle. The descent is fantastic; retracing our steps the way we came up it is flowing without being overly technical or tight. You can often see below you so have a clear idea of what is coming up next and whether there is any traffic. Drivers on Teide are particularly considerate, every time I flew up to one I was spotted in the rear view mirror and the driver indicated and pulled over. The only thing you have to be really careful of is the cloud. We hit it at around 1,800m and for a few moments we were treated to an unusual combination of light shafts being diffused through the mist creating beautiful yet eerie scenery in the pine forests. However it was short-lived and soon we were into dense fog where it was hard to see more than 15 metres ahead. The temperature dropped considerably and I was aware of the droplets of water covering my bars and top tube. It was like the worst kind of wet winter morning. By just below Vilaflor the cloud had disappeared again and we were back into warm sunshine. Looking back and upwards toward the volcano we could see the ring of cloud circling Mount Teide and the summit rising up into the blue sky above. Tenerife and Teide are unique in many ways – in a four-hour ride of just under 80km we had ascended and descended 2,100m and experienced several different types of scenery and terrain. If you are fit and want to get seriously fit this is definitely the place to come to. The climbs out here are much longer than any I raced on during my hill-climb campaign. It takes a lot more endurance to get up these ones. There are no really steep climbs here, making Teide possible for everyone. Tenerife is a great location to ride because of the weather and mountains. Being able to climb to over 2,000 metres in December is rare in Europe, but we have been. The roads are nice and the drivers friendly. We have been lucky to have support from Neon Velo which has taken the adventure out of our training – without their car following we would have to carry a lot of clothing for the long descents. This is my first time on the island of Tenerife and it is definitely a great place to get away from the UK winter weather. There is pretty much no flat on the island which can be tough mentally when you are tired. Very few of the climbs are steep so if you come here with the right gearing, then you can tap away at them at a pace which is comfortable for you. We have been riding from four to seven hours each day, with the longer days seeing us go over the top of Mount Teide. 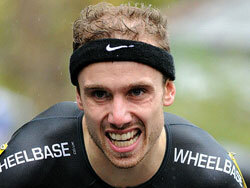 To climb for 50 kilometres is not easy, but by pacing yourself it is possible! Tenerife is a great riding location and I can understand why Team Sky has used it so much. 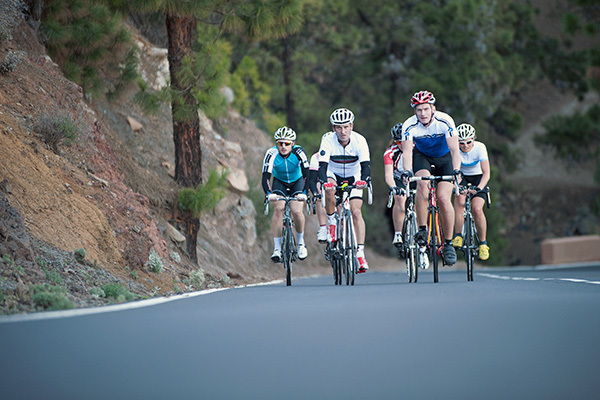 It is around 50 kilometres up to the highest point on Teide, 50 kilometres of climbing. When you are tired this is mentally very tough, but at five-seven per cent average gradient, it is a climb which you can get into a rhythm and work at a specific level. We have climbed Teide on our longest days, six plus hours, which has really pushed us. With it being the winter we are concentrating on endurance, so the long climb is perfect for this. I would recommend anyone to come out here because the landscapes are so varied that they keep you motivated to carry on up the mountain. My first impressions of the island were good. It’s definitely a great destination to get some warm weather riding in during the winter months and you can certainly see why the pros use it. If it’s hard riding you’re after, you have endless choices with various tough routes, all linking up to the top of Mount Teide.Steadier climbs or easier days are also possible. Though you are spoiled by the vast amount of climbing and descending, unfortunately, you won’t find any flat rides on the island. So for that day you just want to spin to the cafe or a quick two-hour blast, you can’t really do that, which is a shame. I think Tenerife can be a great place to ride your bike, but only for specific reasons, to get away from the winter gloom and to get some good, solid training in. If that’s not what you’re after you may find some of the other Canary Islands or Spanish destinations tick more boxes for you. In the hot summer months, Mallorca is a better option, is closer to home and has all the usual variations bike riders look for. 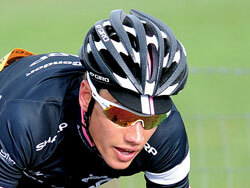 Polka Dot Cycling Holidays is run by owners Stu and Jen Caldicott. They are both experienced riders and former road racers who now specialise in running mountain holidays for cyclists. Based in France for the summer season, they decamp and follow the sun to Tenerife for warm weather winter training. During February, March and April they run structured training camps that will help you get the most out of your time in Tenerife. Their mix of routes will work on your fitness, technique and bike handling. Thanks to their vast amount of experience of running and taking part in camps Jen and Stu will ensure you pace your week so you go home fitter rather than absolutely shattered, which is so often the case with unstructured camps. All rides are fully supported so there is water, energy products and even a cup of coffee on hand whenever you need it. With the huge changes of altitude and temperature that you can experience on Tenerife its important to have plenty of spare layers to hand and a following van comes into its own here. Most of their trips are based from La Caleta on the west coast but there is a ‘sleep at altitude’ week at the Parador running from the April 20-27 with places still available. 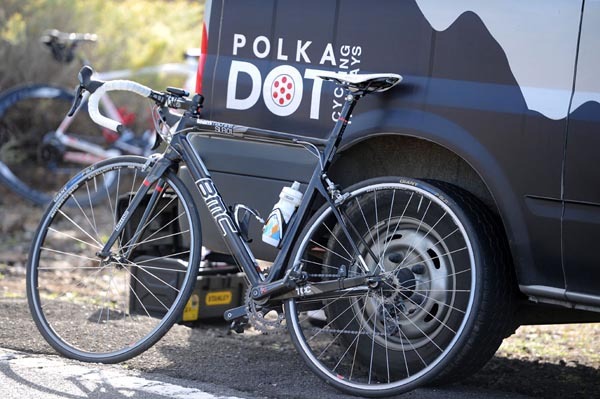 For further information, prices and booking visit www.polkadotcycling.com.